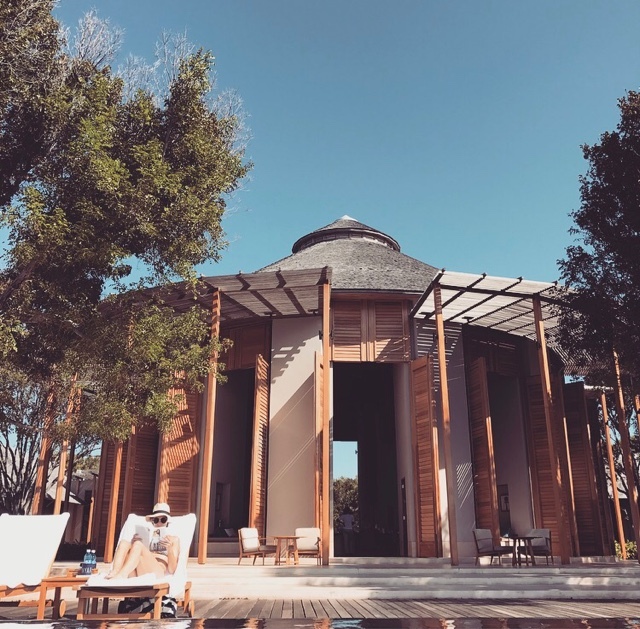 A glimpse into our trip at the Amanyara Resort along with some helpful recommendations. From Pavilions to Residences – you can’t go wrong. Either it’s a pond view or an ocean view – which when it comes down to it, you can hear the ocean from practically any spot. They (Amanyara) will pick you up from the airport in their branded Land Rovers with a 20 min (somewhat bumpy) ride to the resort. You are greeted by all the managers on site when you arrive and handed a tasty little beverage. They have community bicycles which I loved. For such a ritzy place, it was quite refreshing to hop on a bike and pedal to and from the main resort area to our pavilion. Our pavilion was on the pond – but they are all so secluded. You can’t see a neighbor, nor will you ever see anyone in/around your hut. It rained a bit while we were there – they were equipped with umbrellas everywhere but the winds kept them moving. We lost power (the whole island did) for like 2 hours – they totally kept their cool and even gave us a glass of super smooth (realllly old) tequila to sip while we played Scrabble and waited it out. The whole resort is stunning – wood planks, clean lines, very feng shui. Architect is Jean-Michel Gathy and I would give him an A+. PS. Watch their site for special packages – we snagged their Winter escape package that bundled in breakfast/dinner. With only two main restaurants they do a pretty great job of not letting it get boring. The main restaurant has different specials (starter, main, dessert) every night and the beach restaurant will do theme nights (which aren’t part of any paid dining program) but they give you the option. Majority of the staple dishes are either Asian or Mediterranean influenced. Get the tea over coffee. Falafel sandwich at the beach restaurant. Any sorbet or ice cream. French toast or breakfast tacos for breakfast. Dinner truly just take your pick. Conch and lobster are their pride and joys. Mexican Mule and Cherry Whiskey Sour were favorites. It’s a super small resort when compared to other brands, but the largest of Aman. With 40ish rooms, the place never feels crowded. The staff knows your name, your anniversary, birthday and will gladly surprise you with things throughout your stay. They sang me happy birthday the first night, and left us a bottle of champagne for our anniversary. They had folks from other Aman resorts like Greece and Montenegro which was really neat – we learned more about the Aman culture that way and now we have an itch to visit them all. Every night when they do turn down service (which you’ll NEVER notice) they leave a note and a little treasure on your bed. We got a canvas bag, towel and magnet – sweet keepsakes. Sounds & Looks Amazing ! !